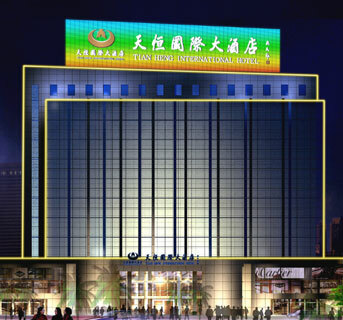 Located in city center, 3km to railway station, 10km to airport; Surrounding landscape: Xiuhu Plaza – Yimei Plaza hotel is located in well-known abroad Chinese small commodity city -Zhejiang Yiwu province, subordinates the Yimei group. Is situated at the lively town center, adjoining embroiders the xiuhu square. The hotel floor space is 51000 square meters, ground high 28, underground 2. The hotel has many kinds of comfortable and warm guest room: Standard Twin Room, Single Room, Visual room, Executive room, Business suite, Deluxe suite and so on. Distance from the airport ( Km ):15kms Distance from the railway station ( Km ):15kms Distance from city center(Km):1 Surrounding landscape: Yiwu international trade city, Dongyang Hengdian film city corporation, Futian Market. – The hotel is enjoys geographical advantages and convenient transportation. Located 5 minutes walking distance from the Railway Station. Situated 15 minutes by car to the Yiwu Airport. Distance from Binwang Stataion:1km Distance from International Commercial Center (Futian Commodity Center):2 km Distance from Binwang Commodity Center :0.5km – Located in the busy business center of Zhejiang China Commodity City. Located in the Mall Road and Ring Road junction, 10 minutes drive from the International Trade City,5 minutes drive from the railway station/airport and Hangjinqu expressway entrance . – Your World International Conference Centre both the bustling city of international business environment, and also located in Yiwu City where has the most beautiful areas of the natural environment, garden-style low-rise building planning and design, to create a pro-integration with the natural landscape and ecological holiday atmosphere, top meeting venue , first-class entertainment, dining, leisure facilities, It is the first choice for stating guest reception, administrative activities, high-end business, leisure and international conferences. The hotel is only 15 minutes’ drive to the city center, airport and railway station; 5 minutes’ drive to the long-distance bus station, and 10 minutes’ drive to the commodity market of China. – Ramada Plaza Yiwu Zhijiang Hotel is a four-star hotel affiliated to the largest hotel group Wyndham Worldwide, and is the first hotel with the brand of Ramada in the central area of Zhejiang Province. The hotel is 19 floors in height and totally has more than 260 guest rooms. With its diverse restaurants, Japanese food, pubs, the well equipped health care, sauna and amusement center, it can meet the requirement of various people. The hotel is located in the city center of Yiwu; To Yiwu International Commodity Centre just need 3 kms About 10 minutes to the airport; Only 5 minutes to the exhibition center. – Located in the city center of Yiwu. Broadband internet access is available in all rooms. from Yiwu airport 10 minutes, distance to Yiwu new railway station and Hangzhou-Jinhua-Quzhou highway is shortest beside the office building on Beiyuan street in Yiwu – Located in the ‘ First International Trading City in Asia’ -the Beiyuan Industrial Zone in Yiwu, the hotel is only 10 kilometers to Yiwu Airport and a few minutes to the railway station. It’ s the nearest hotel from the Airport, Train Station and the High Way. 4. guests use the room caard can free enjoy Sanua, swimming, fitness items(only for male guest). To the airport: 12km To Xiuhu Square: 1km To Yiwu Railway station: 12km – Yiwu Ssaw Hotel is located in the famous commercial cityâ€”Yiwu. This hotel is in the bustling downtown, with the coach bus station nearby. So this hotel is with convenient transportation. To Civil Aviation Airport and Railway Station: 20 minute-drive from the hotel. – Bali Plaza Hotel is located in well-known abroad Chinese small commodity city-Yi Wu of Zhejiang province. The hotel is in the middle of the city near by the city government, people square. Yiwu Airport 7 km; Xiuhu Square 1.5 km; Yiwu Railway Station 8 km; International Trade City (Futian Market) 3 km; Municipal 1 km; New International Convention and Exhibition Center 3.5 km – YiWu SSAW Hotels-Huafeng is a kind of new styles of city chains hotels which is invested and administrated by ZheJiang Narada Hospitality Service CO.LTD. Located in No.2 Airport Road, Yiwu City, Zhengjiang. Located in the bustling downtown center location, it has conveniently situation. Hotel is located in the Baiyun Cultural Center at Dongyang City with an advantageous location of the center of Jinhua Economy ” Golden Triangle” ! It is only 9 minutes’ driving from Yiwu Commodity Center and 10 minutes’ driving from Hengdian Movies and Television Center, 1.5 hours from Hangzhou, 2 hours from Qiandaohu Lake, 2 hours from Shanghai, 2 hours from Ningbo, 3 hours from Shaoxing, 3 hours from Wenzhou. – Shining Hotel is an ideal place for business, recreation and vacation because of its quiet and secluded landscape. The hotel has good transportation with the Bingwang Market to its east and the railway station to the west. It takes just 15-minutes by car to reach the Airport. – It is very convenient to reach the expo center. Hotel is located in commercial center of Yiwu city, and adjacent to the International Trade City which known as “the world’s largest market”, 5 minutes’ driving from Yiwu International Exhibition Center. – Yiwu legend Hotel is managed by Omega hotel management company, it is a joint venture, with the features of culture theme Mansion Hotel. Hotel is a pioneer of Mansion Hotel in Yiwu. Hotel is located in commercial center of Yiwu city, and adjacent to the International Trade City which known as “the world’s largest market”, 5 minutes’ driving from Yiwu International Exhibition Center, with strategic geographic location. The hotel is 25 minutes’ drive to Yiwu airport and railway station, it is a five minute walk from the World Trade Centre and a short ten minute commute by hotel shuttle to the Yiwu International Commodity Centre, drive 25 minutes’ to Hengdian. – Ramada Hyde Hotel covers an area of 61, 854 square meters and has 586 comfortable guest rooms, various kinds of conference rooms, and restaurants with delicious foods. The hotel is decorated with American style. Its good service and pleasant environment will surely make you feel ease and relaxed. Distance to airport: 8km Distance to railway station: 8km Distance to city center: 4km – Milan Holiday Hotel, Yiwu is a new business hotel with refined decoration only 3-5 minutes by car from Yiwu International Trade City. 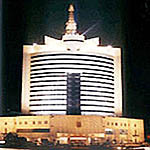 Distance from the airport: 20km Distance from Yiwu railway station: 20km Distance from the municipal government: 3km Surrounding environment: the international trade center, Futian Market, Binwang Market, Underground shopping center, the municipal government, Meihu exhibition center, etc – Yiwu Suofeite Hotel is located in the flourishing business area of Chouzhou Road. 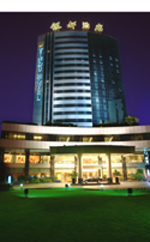 Adjacent to the largest international trade center in Asia, the hotel boasts an inclusively favouable location. 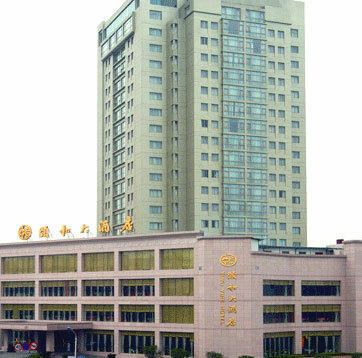 Diyuan Hotel is neighboring with Yiwu downtowm, the provincial economy development zone and Beiyuan industrial zone. It is only 2 minutes’ drive to Yiwu Agriculture-Trade City, 10 minutes to the railway station, and 12 minutes to the airport. – Diyuan Hotel is a modern business and conference hotel built in accordance with 3-star standard. Characterized by convenient transportation and perfect location, it owns 120 guest rooms in various types and 500 dining seats. Yiwu thick Chau No. 877 (In the opposite of International Trade City Gate 1 E1), close to the railway station, City Centre: 3 Km; Yiwu Railway Station: 12 Km; Airport: 12 Km; Ferry 3Km; – Yiwu Jinda Hotel is a foreign-based business travel hotel, whose guest rooms in accordance with national standards for the design of 3-star.It is located in North Road, Yiwu thick Chau No. 877 (In the opposite of International Trade City Gate 1 E1), , close to the railway station, the cultural market of Zhaozhai, subsidiary food of Binwang, clothing market, long-distance passenger transportation center of Binwang . Adjacent to Binwang Market and Bus terminal; To Yiwu International Trade City and International Confernce and Exhibition Center: 0.5km; To Airport: 15km, distance from Railway Station 18km. 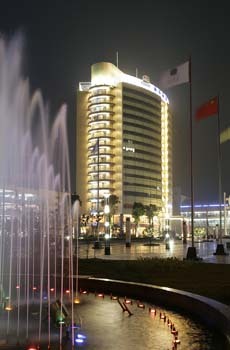 – On the basis of five stars standard to construct a synthetic and deluxe business hotel YiWu international Masion, Be managemented by Park hotels the international limited(hongkong).It’s adjecant to the Binwang Market and Bus Terminal, about 0.5km to the International Trade City and International Conference and Exhibition Center, about 15km to the Railway Station and the Airport.